Dragonfly Turquoise Cuff Bracelet by Albert Jake! Sterling silver cuff bracelet with 3 lovely blue Dragonfly Turquoise stones. 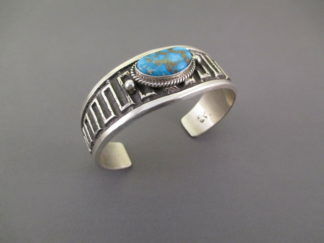 Made by Native American (Navajo) jewelry artist, Albert Jake. Lovely turquoise bracelet with excellent stones.